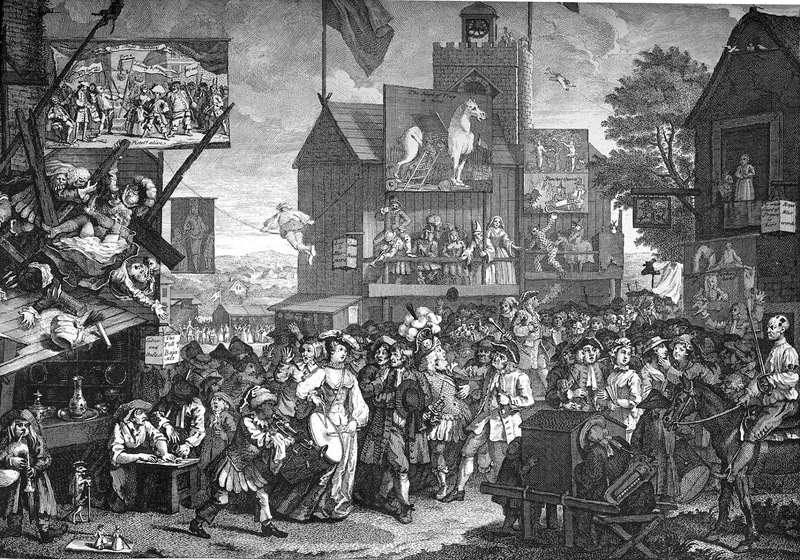 The principal view upon the left represents the fall of a scaffold, on which was assembled a strolling company, pointed out, by the paper lantern hanging in front, to be that belonging to Cibber and Bullock, ready dressed to exhibit “The Fall of Bajazet.” Here we see merry-andrews, monkeys, queens and emperors, sinking in one general confusion; and, that the crash may appear the greater, the stand beneath is humorously supposed to consist of earthenware and china. Notwithstanding this fatal overthrow, few below are seen to notice it; witness the boys and woman gambling at the box and dice, the upright monkey, and the little bag-piper dancing his wooden figures. The next paintings consist of the fall of Adam and Eve, and a scene in Punch’s opera. Beneath is a mountebank, exalted on a stage, eating fire to attract the public attention; while his merry-andrew behind is distributing his medicines. Further back is a shift and hat, carried upon poles, designed as prizes for the best runner or wrestler. In front is a group of strollers parading the fair, in order to collect an audience for their next exhibition; in which is a female drummer, at that time well known, and remarked for her beauty, which we observe has caught the eye of two countrymen, the one old, the other young. Behind these men is a buskined hero, beset by a Marshalsea Court officer and his follower. To the right is a Savoyard exhibiting her farthing show; and behind, a player at back sword riding a blind horse round the fair triumphantly, in all the boast of self-important heroism, affecting terror in his countenance, glorying in his scars, and challenging the world to open combat: a folly for which the English were remarkable. To this man a fellow is directing the attention of a country gentleman, while he robs him of his handkerchief. Next him is an artful villain decoying a couple of unthinking country girls to their ruin. Further back is a man kissing a wench in the crowd; and above, a juggler performing some dexterity of hand. Indeed it would be tedious to enter into an enumeration of the various matter of this plate; it is sufficient to remark that it presents us with an endless collection of spirited and laughable characters, in which is strikingly portrayed the character of the times.